Can Port Authorities Save the Planet? I’m shamelessly borrowing my title from a recent New York Times article. 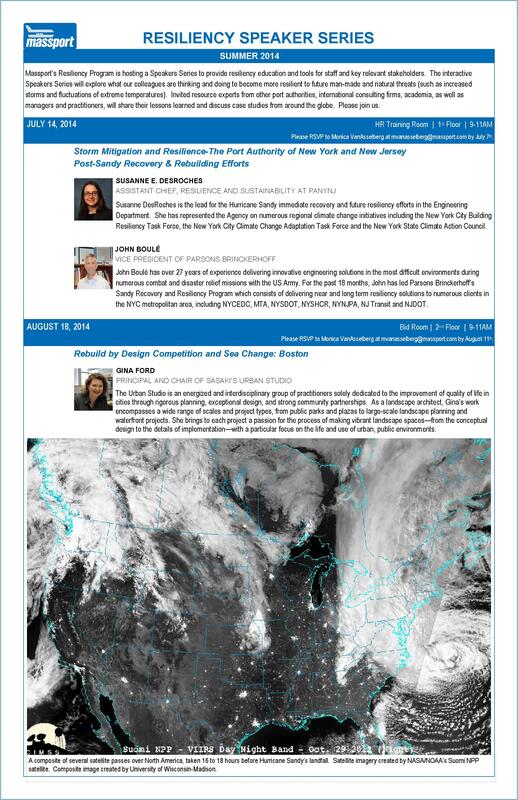 The article begins with the Port Authority of New York and New Jersey, moves on to talk about the importance of estuaries and wetlands, and ends by pointing out the meaninglessness of geographical boundaries when issues like sea level rise don’t end at a single state’s border. The article wraps up with this statement: “What we need are port authorities…These authorities are typically concerned with transportation infrastructure, but they can be reformed and placed in charge of overseeing development at the intersection of land and sea.” The author suggests that Port Authorities could become leaders in environmentally conscious planning and restoration. Read the full article here. One of my main projects this summer involves designing a series of webpages about resilience, to be hosted on Massport’s official website. During the last two weeks, I’ve been working with a web content manager to get my layouts and materials onto a test server for review before the site goes live. 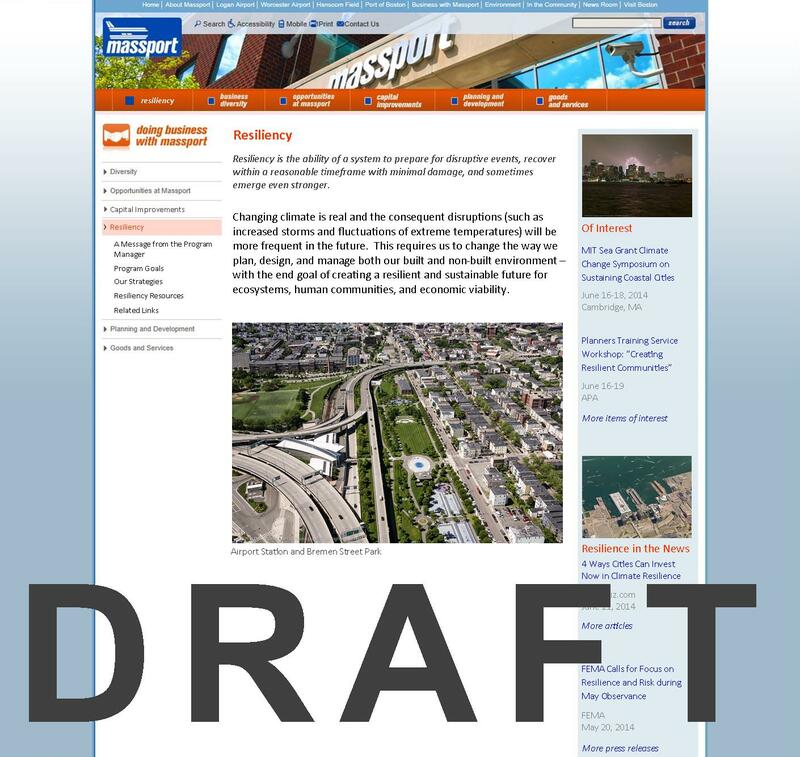 We had a meeting last week to introduce the site and get feedback—it was the Massport equivalent of a crit. Despite a brief, last-minute panic while setting up for the meeting (the projector wasn’t working! We couldn’t access the test server link! The department’s IT expert was out of the office all day! Senior staff members got to the meeting early and witnessed everything!) the meeting itself went well and we got some great feedback. In response to that feedback, I’m working on another round of editing before the site is introduced to Massport’s CEO, after which the webpages will go live mid-July. 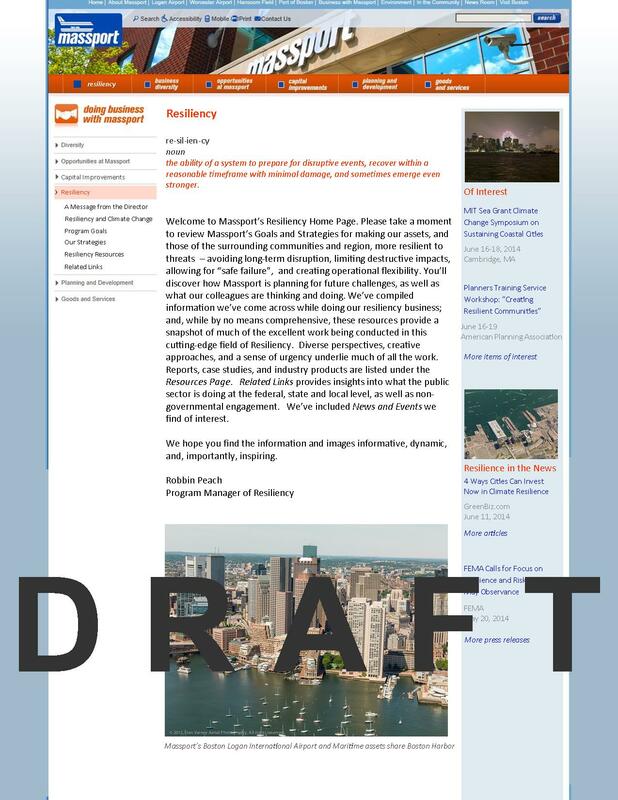 An updated draft of the Resiliency Website homepage, now on Massport’s test server. Now that my work on the website is further along, I’ve started researching existing resilient building standards in preparation for drafting a new set of resilient guidelines. I’ll post more on that later, as the project evolves. We’re also ramping up for our Resiliency Speaker Series, which begins on July 14th. I designed a survey (keeping RISD’s end of semester evaluations in mind) to be handed out to attendees so that we can get feedback on the Series and on our Resiliency Program. This past weekend, I read a book titled Around the World in 13 Schools, where a team of educators, researchers and designers traveled to four different continents in search of the most innovative pedagogical models. My conclusions after following their journey through this documentation of their experiences are that there is no single method or formula for education, and that the most appropriate education style varies not only by culture but also by the needs of each student. Most importantly, I learned that students should not be treated as a whole, but as individuals and that ultimately everyone is a student. The entire book, Volta ao mundo em 13 escolas, can be found (in Portuguese) on this link. Paulo Freire’s Pedagogy of the Opressed can be found here. This writing is a little more traditional than what we are looking at today, but gives us a sense of the concepts were are still grappling with in terms of education and development. 1) Can I take 30 seconds of your time? The weekend before I started my fellowship, I did what makes the most sense for a slightly awkward, bad-at-smalltalk girl to do: I went canvassing. (Seriously, if you want to get better at chatting with random strangers, go knock on their doors.) The context: With two weeks left in the RI state legislative session, it was looking like the Just Cause bill might get shelved. The bill would protect good, paying tenants from getting evicted by banks from foreclosed properties – people couldn’t be evicted without just cause. Though similar legislation has existed in Massachusetts for 4 years, this was the 6th year Just Cause was up at the State House. DARE (Direct Action for Rights & Equality, an organizing group in Providence) had planned this last-ditch effort to canvass Cranston neighborhoods in Speaker of the House Nicholas Mattielo’s district. The goal: make as many phone calls as possible to the speaker’s office in support of the legislation. After a short training, my canvassing buddy Lilia departed to our turf, clipboard in hand. Hello? We’re not asking for any money or trying to convert you, I promise! The expected: many people didn’t answer their doors. We met some angry people. The unexpected: We actually got a lot of calls made – 7 in about an hour and a half, though we had projected a rate of 1 in 10 houses. There were lots of encounters with small dogs. Some people were really nice. Someone offered me a soda. I canvassed again with DARE the following weekend, as the bill hadn’t moved. 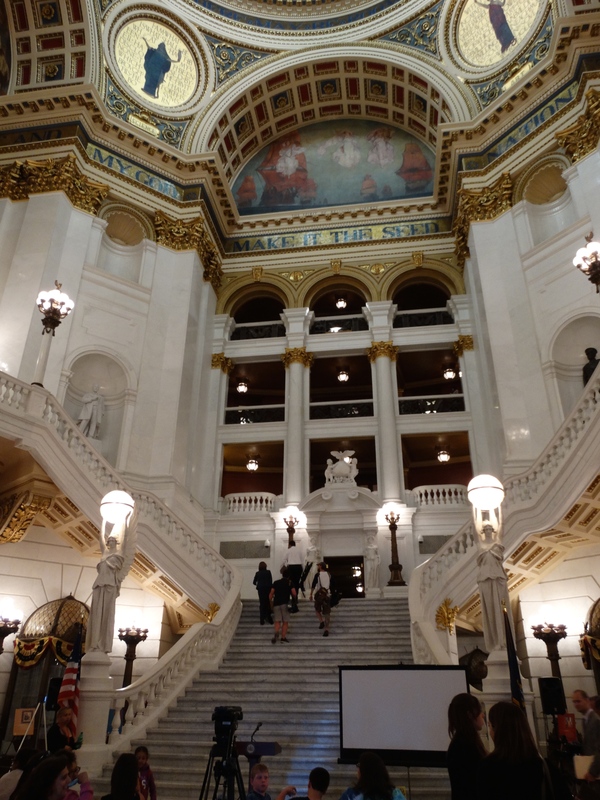 Since the last week of the session was approaching, a direct action was planned for mid-week. As Wednesday came, amazingly something shifted – and Just Cause passed both the House and the Senate. Pending the governor’s signature, it will be finally official. Canvassing reminded me that the local political process is really important. As a designer, I think that technology has the incredible potential to support civic engagement – and there are so many examples of where technology has allowed new forms of participation and communication to occur. Yet, it can also supplant and dissolve the power of people coming together – showing up and communicating in the flesh – with undesirable consequences. How can arts, design, and advocacy work best together? So, next time a stranger knocks on your door, please hear them out, if only for 30 seconds. Last week, we went to a city council meeting to support the introduction of a new bill: the Community Safety Act. Some of the pieces of the act include requiring police officers to document information each time they stop someone, including race and ethnicity, age, and reason; protecting the right of women and transgender people during searches; and guaranteeing the right of civilians to record police activity. In a press conference prior to the council meeting, several individuals spoke on their experiences being victim to racial profiling. The meeting itself was pretty straightforward, and though this was the introduction, it will take time and much work for a bill like this to pass. Court is a confusing place if you don’t know what’s going on – which I assume is most people if they haven’t been to court before, and especially if you have to represent yourself. I was definitely confused. The building itself is designed to appear very institutional and imposing. Inside the courthouse, I observed many different kinds of transactions taking place. Physical forms, directions, documents facilitated flows of people, who need to have particular things and show up where they need to be at the right time. Private conversational transactions between (who I assumed to be) attorneys and clients happened out in the open in the bustling hallways – possible to be overheard by anyone. People literally come to the courthouse to pay for things. There were many children being wrangled into order – or not. Some transactions were very clearly disrupted by language barriers – and I observed various routes around that. Authority is very clearly worn in the court. The Garrahy Judicial Complex, home to Family, District, and Workers’ Compensation Courts. Built in 1981. I didn’t even make it into any actual courtrooms (though I hope to do that later), but it was fascinating to see what kinds of things I could observe happening. I also realized very clearly while I was jotting down notes that my interpretation of what was going on could be, in fact, really far off from what was actually happening. It’s easy to observe – a tall white guy wearing a suit and holding a briefcase while chatting to other guys (and some women) in suits – and think attorney. Or to see several people clustered together and talking, all wearing street clothes, and think family. Yet, maybe they are just friends. Maybe the guy in the suit is a social worker – or someone representing themselves. I hope this gives a better idea of what I have been doing, and what I will be doing through the summer. Onwards! Trying to find information on the RI courts website prior to visiting…also kind of confusing! WARNING: the following is a long, pretty self-conscious, and potentially self-indulgent footnote to this posting reflecting many things I think about, which you can decide to skip should you be satisfied with looking at my cool pics above. (Blocky courthouse architecture from the 80’s is so fun, amiright!?) But, should you somehow be interested in a foray into Allison’s introspective meanderings, forge ahead. I guess it’s kind of a blog post within a blog post, if you’re into that. Only now we’re in italics, which means I don’t have to be as coherent. Do people actually read these things? I went to the the Harvard Natural History Museum this past weekend as part of a Harvard Metalab workshop about museums, and I think this little guy’s expression shows pretty well how I feel when faced with a situation like canvassing. Also, I relate very much to this guy. C’mon, look at those little teeny legs on that round body, that tiny tooth sticking out, and those what-am-I-doing-here eyes! Nature is funny. (Or maybe just taxidermy is funny). Every month at Porvir, everyone sits around a large table for what is called “confraternizção,” or fraternization, in English. This is a moment for everyone to share a short bit about what he or she (but mostly “she” here at Porvir) is currently working on. There is always a new theme to start the discussion, but the conversation is free to flow in any direction. In terms of an office culture, this creates an environment where everyone learns a little bit about the people with whom they share the space on a daily basis. It’s also an opportunity for everyone, no matter what position within the organization to sit down and listen to each other. On my first day at Porvir, there happened to be a confraternização scheduled. To start off, each person was asked to share a story about how they arrived at Porvir, or a funny experience related to their work in the education world. As the women around me began sharing their stories, I grew more nervous about what I would say. I decided to share a story that to me, was a big moment of realization of the potential of the education system, and how it currently works. I have spent my summers in São Paulo each year since I moved to the US. Every time I come, I engage in a community service project, usually related to the arts. Last summer, I discovered a day care program in the heart of Paraisópolis, São Paulo’s largest favela, that offered programs for kids before and after school. I contacted Instituto Prof with a proposal to prepare some workshops and drawing classes during my stay in São Paulo. The director was thrilled with my idea, and we set a date. I arrived at Instituto Prof with a big bag of art supplies, some of which I had even brought from the US (because pipe cleaners don’t exist in Brazil)! I was greeted with many smiles at a tall white gate and was guided past a basketball court to a large classroom. Inside, ten desks were arranged to form a large work surface. There were paper and drawing tools set up and everything seemed great…until I looked up at the faces around that table. They were all teachers! The workshop went really well, and I was asked to return the following week for another class, with the kids this time! From that day on, I was enchanted by the power of small tools that can make a big difference. By just showing a classroom of teachers the power of creative expression through freehand drawing and coloring “outside the lines” I saw the potential of making an even bigger difference. Since that day, I have kept up with innovations in education tools and different pedagogical styles—beginning with reflecting on my own education, from primary school through my experience at RISD. This story sums up my initial interest in applying my education in design, and more importantly Design Thinking, toward addressing a problem in the education system. My first week at Porvir can be summed up in short with the absorption of lots of new material. I am delving deep into the world of education, and exploring the use of different media to communicate innovations in education from around the world to a Brazilian, but eventually more international audience. My project at Porvir is to create a compilation of the “top 100” innovations in education. Many of these articles will come from existing publications from the website and sources that we are already familiar with, but my job will also be to search new sources for developments in this field. Porvir is already a respected source for education news and innovation in Brazil, but we are working to gain international recognition and make global partnerships. The goal of this publication is to share with an international audience at a world-wide conference on education in Qatar this November. The first step in this project is to develop an action plan for my eight weeks at Porvir, and beyond. Tomorrow, I will go over the existing sources and begin to scan the articles that have recently been published on the site. My role as an English speaker will also be helpful in finding many sources that the existing Porvir team may not be aware of… although most of them either speak or are learning English as well! I’ve already delved into the online education world, but even after four hours of serious web-surfing, I feel like I have just touched the surface of this vast world. There are many sources and innovations taking place all over the world. The challenge will be to collect this information in a way that will be organized, visually comprehensible and coherent to the topic of the research. Anna made note for me to keep in mind that “Top 100” should not be a hierarchical categorization, but actually a representation of the variety of forms that innovation can come in. The pieces selected for the publication are not devaluing those that were not selected. This is where the process of categorization for the series of pieces selected will be very important so that the project is cohesive as a whole. Three 3 lb packages of honeybees arrived in mid-may. Each package contains approximately 11,000 bees. 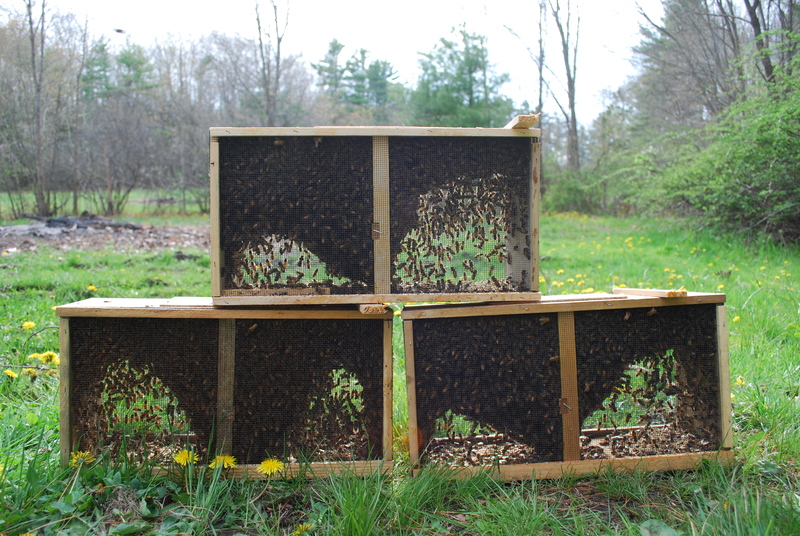 These bees have been installed in three hives and are currently building their colonies. 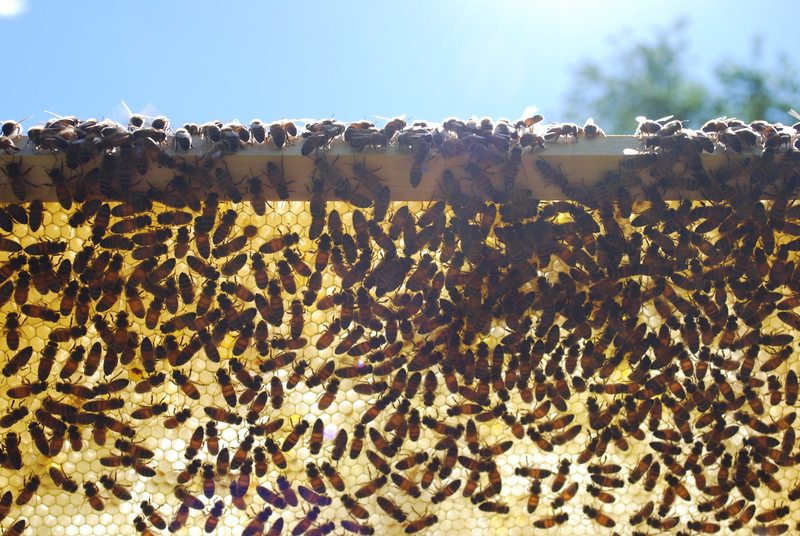 For the last month the bees have developed their colonies building comb on wax foundation. They have been feeding on sugar syrup and local flowering plants (dandelions and clover). And have been busy nursing their next generation brood. The observation hive is still in concept development and set to begin with designs and construction in July. 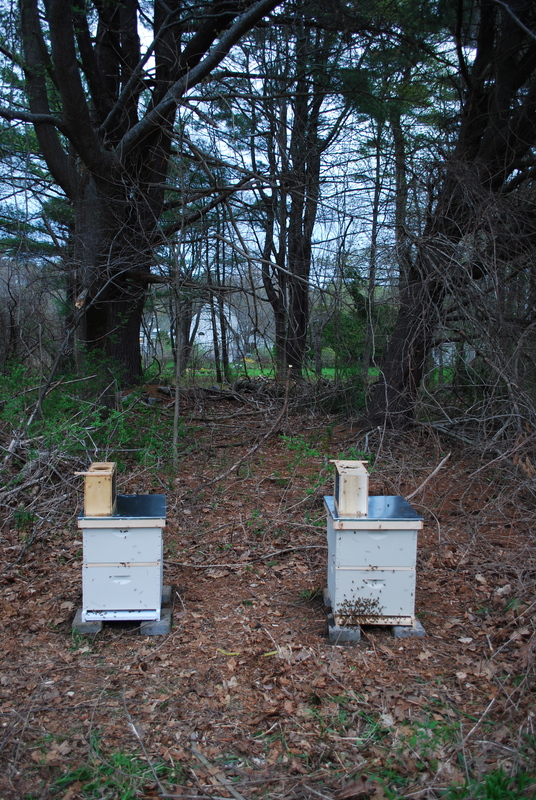 Until then, I’m checking the hives every few days, refilling the sugar syrup and checking the colonies health. 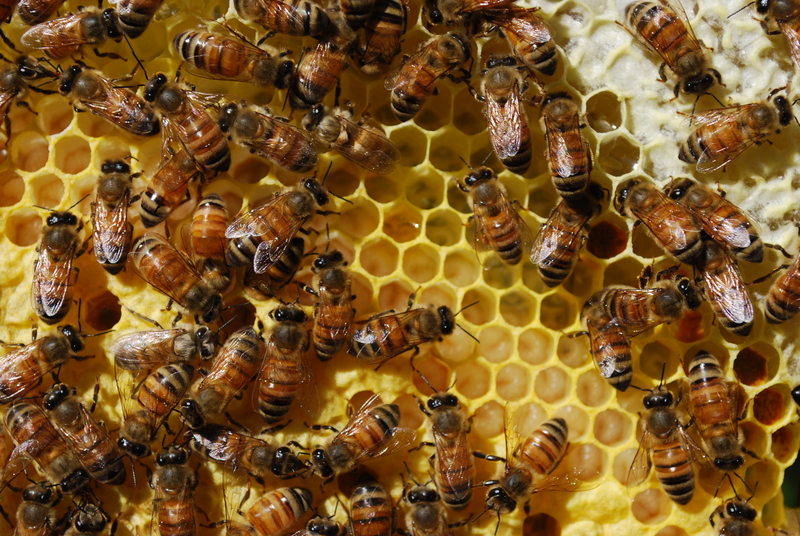 Additionally, the US government recently passed legislation for $8 million dollars in funding for the EPA’s creation of a task force to directly investigate and determine the causes of dwindling honeybee populations across the country. Read about it here. My first project at the National Museum of American History was to review the ibook the Smithsonian intends to publish to introduce 3D technology to the classroom via the story of Abraham Lincoln. (Two of the first 3D scans of the collection included life masks of Lincoln.) The ipad format has opened up a lot of room to create various interactive tools (maps, timelines, 3D viewers, etc.) that create a much more dynamic experience than a printed textbook. As a life-long science and math nerd, I have to admit I find history pretty intimidating. Surprisingly, this has become a bit of an advantage these past couple of weeks. I am much less immersed in the historical content of the book so I think about the application of this tool in very different ways than the creators. My first encounter with this was trying to distill the audience for the book (and some of other tools we are working on). There are various layers of complexity that make this a difficult task not just for the Smithsonian but for others working to incorporate 3D tools in education. 3D visualization technology (scanning, printing, etc.) has been hailed to be the ultimate resource to capture the attention and imagination of students who otherwise would turn away from STEAM fields. The technology affords a feeling of ownership of your own tangible creations. However, these tools are still relatively expensive and require a high level of competence in the field. So they typically end up in schools that already have high-end resources (technology and staff) and in the hands of students who already STEAM-inclined. As the technology becomes cheaper and more accessible, the learning tools will need to be adaptable to the changing environments in which they are presented. Also, there are a lot of nuances of proposing “multidisciplinary” learning in traditional schools where engineering, history, and art are taught during three different time blocks, by three different teachers who are teaching to three different types of skill assessments. A choppy transition between any of the disciplines undermines the benefits of multidisciplinary learning. Part of my work here is to create a various interactive elements for the book that would mitigate some of these issues. One of the ibook activities involves re-creating Lincoln’s life mask using the 3D scan data and paper-craft. What Do Resilience and the Red Sox Have in Common? Both have come up within my first two weeks at Massport. Part of my Fellowship proposal involves building a website that can serve as a resource for resilience. I’m excited to report that instead of hosting this website on an external server, I’m adding a new section on resilience to Massport’s official website. These resiliency webpages will probably go live sometime next month and I’ll continue updating the site until my internship ends. 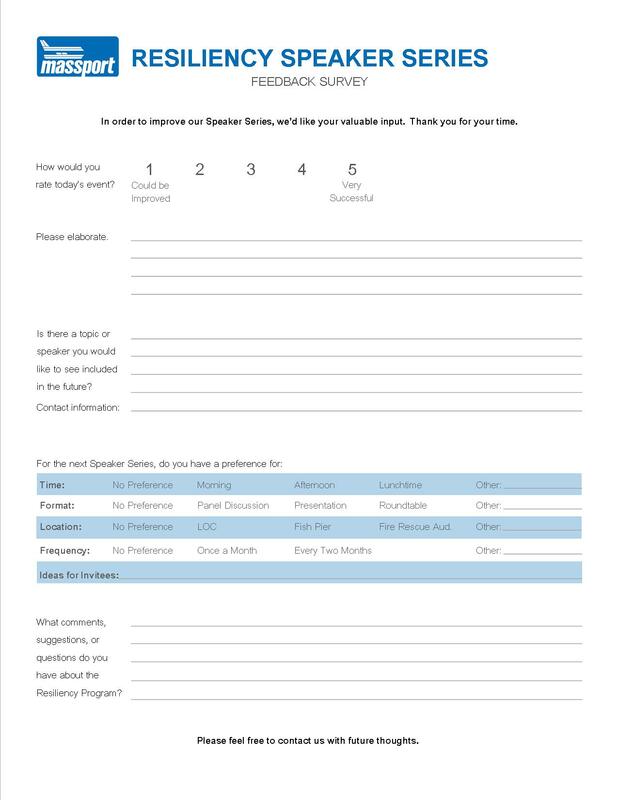 I’ve been helping to organize a Resiliency Speaker Series. I designed a poster for our Summer Series, which includes a speaker from Sasaki’s Urban Studio. Within the first few days of advertising the event we received so many RSVPs that we had to consider booking an alternate venue, in case our original room was too small! I’ll finish this blog post off with what might be my favorite image of all: David Ortiz at our meeting this week. Photo taken by Monica VanAsselberg. We had a meeting this past Monday for all of Massport’s employees. They played music by Avicii, Imagine Dragons and Pharrell, there was a line of food trucks and an airplane decorating the hangar that the event was held in—it was unlike any work meeting I’ve been to before. 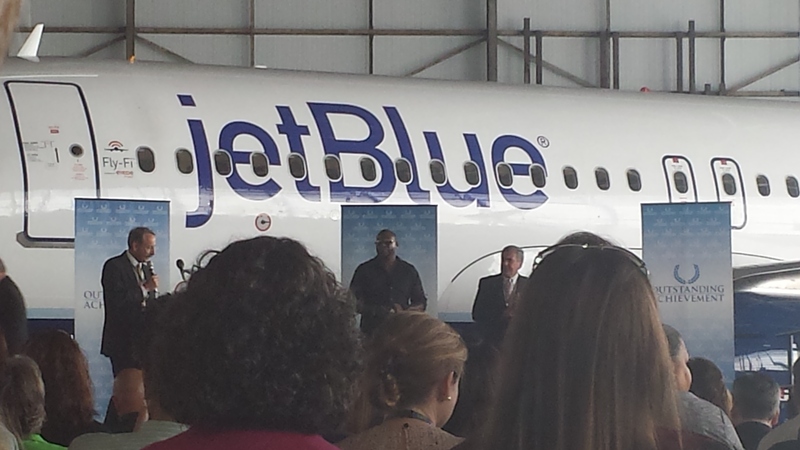 But the real surprise was the special guest—David Ortiz, a.k.a. Big Papi from the Red Sox! The meeting must have been good luck, because the Red Sox won their game against the Minnesota Twins later that night. To explain some of the things I’ve been reflecting on the past week (the first week of my fellowship!) I want to tell you a little bit about my brother. While this post is unrelated to the actual work I’ve been doing (more on that soon to come), I think this background helps set the context for why I’m so excited about this work. For RISD students, I think many of us share similar childhood experiences. We were understood to be the “artsy” ones in the family: the person responsible for setting up the decorations at holidays, for populating the walls with early masterpieces done with fingers and paint – and later with more sophisticated versions executed in acrylic and charcoal. As a girl who (grudgingly) settled for having a pet fish in lieu of a warm-blooded pet, my art for about a decade heavily featured dogs or variations on that theme (dog and pumpkin; dog and car; dog with fireworks, dog in a stream). My older brother, Nate, has always been brilliant – though less creatively inclined. According to legend, Nate spent a large portion of his first trip to Disneyland reading a book. The year I was a dog for Halloween, my brother was a billionaire. Throughout high school, my brother was on the debate team, making it to state and national championships several times. I have always felt challenged by words. Nate and Allison at age 6 and 4. When my brother graduated from USC two years ago with a degree in International Relations, many people envisioned him going off to law school. For a while, he worked in a law firm assisting the attorneys with intellectual property research while studying for the LSAT. However, somewhere things changed and that path no longer made as much sense. Nate recently got a job at Kaiser Permanente, one of the largest health care providers in the US, putting his research skills to work in the Creative Solutions division. This has sent him in a direction that has unexpectedly crossed into the realm of many things I have been interested in. Now he sends me articles about design innovations in healthcare, most recently about the high tech hospitals of the future. How did I end up here, and my brother in the Creative Solutions team at Kaiser? When I came to RISD in 2010, I never imagined that just a few years later I would be undertaking an internship embedded in a law center. And in my first week, it’s been difficult – and exciting – to figure out exactly what my place is here, within the Center for Justice. People have asked me – so what does it mean that you’re a designer at a law center? Are you designing their logo? Well, no. One of the amazing opportunities of this fellowship is that it’s challenging me to think about and communicate what the value of design thinking is to a field like public interest law. I think the simplest way to think about it is that designers are great at observing and understanding how people interact with the systems, products, and services around them. Designers see the human pain points and envision ways to make things work better for people. This skill can be applied to many different fields – including the legal system. The challenge now is for me – along with the awesome people mentoring me and whom I’m working with – to figure out how exactly I can apply this to a specific research agenda that will help support and build on the mission of the new RI Center for Justice. The irony of me and my brother’s crossed paths has challenged me to reconsider the mental divisions I’ve drawn between different modes of work. Artist. Intellectual. Creative. Researcher. Thinker. Practitioner. Designer. Titles can help identify but they’re often irrelevant in the context of interdisciplinary work – none of these qualities exists in a vacuum. My design education has helped me understand design more as a method of approaching problems and investigating the world than as a particular set of outcomes. 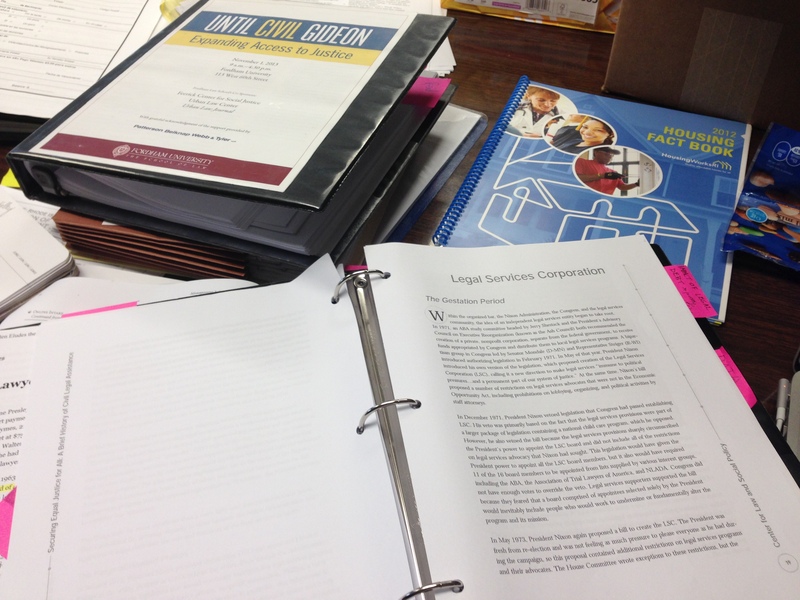 And I’m excited to discover what that really means this summer in the context of legal work. My first week = absorbing LOTS of info about public interest law and the local landscape! For my project, I’m conducting follow-up research on Three Mile Island over the summer to commemorate the 35th anniversary of the nuclear accident. My goal is to approach the incident from a humanistic perspective, interviewing individuals who were involved to understand the social & psychological effects of the accident and its ensuing politicization. Using the interviews and additional research, I plan on creating an artistic re-telling of these stories to be dispensed by Three Mile Island Alert, a local non-profit organization that works with TMI & the NRC to promote safety efforts, in an effort to reach out to younger generations, such as mine, so they may know the people of TMI as well as the story. For the past several weeks I’ve been reading up on the subject, getting info from Dickinson Library and prepping interview questions. RB Swift: A statehouse reporter who covered the incident as it happened. 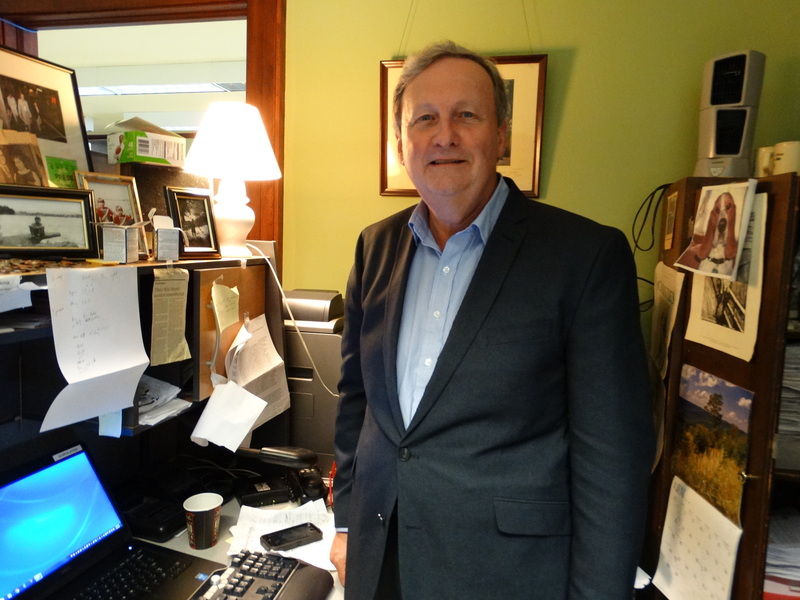 This is RB Swift in his office at the Pennsylvania Capitol. 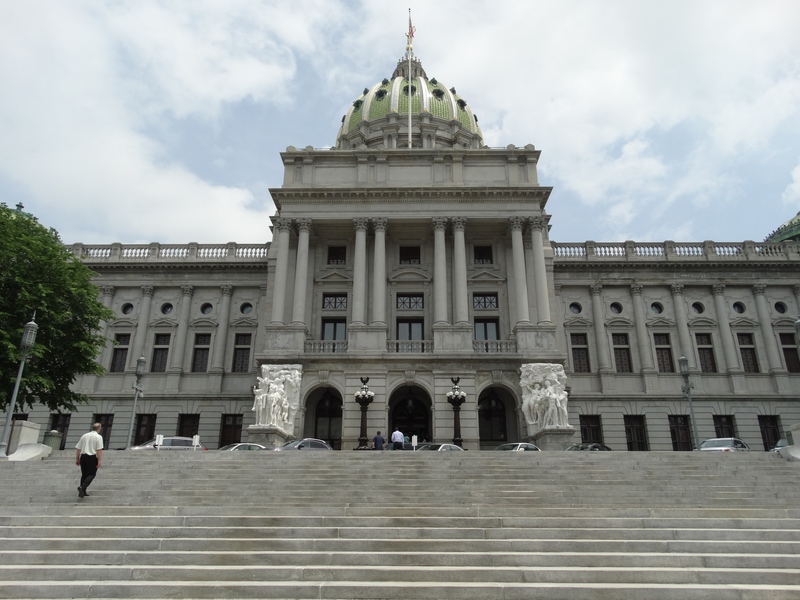 Front view of the Harrisburg Capitol Building. Demonstrators were setting up inside as I made my way to the atrium. 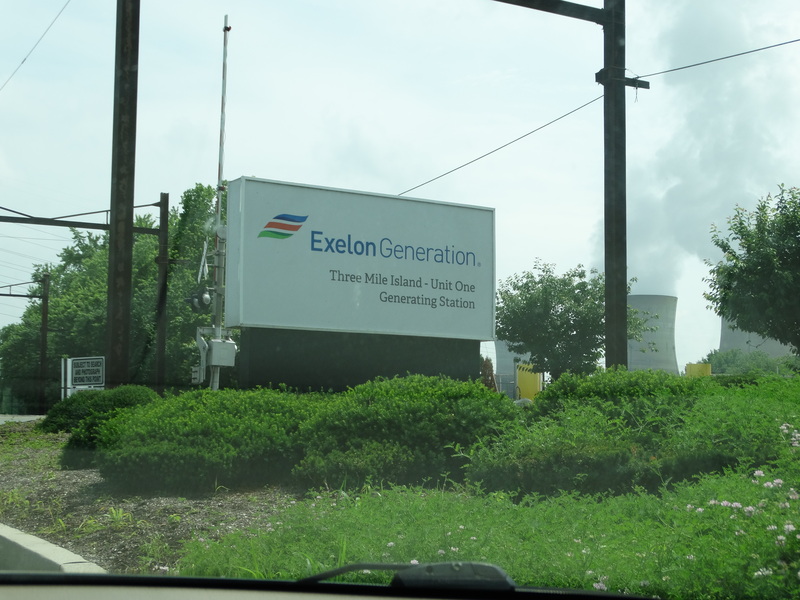 I also interviewed Ralph DeSantis (who was kind enough to give me a tour of the facilities at TMI)– he’s a Communications Manager for Exelon, who are contracted to monitor TMI Unit 2. This sign marks the entrance to the bridge that leads to Three Mile Island. The distinctive cooling towers can be seen in the distance. 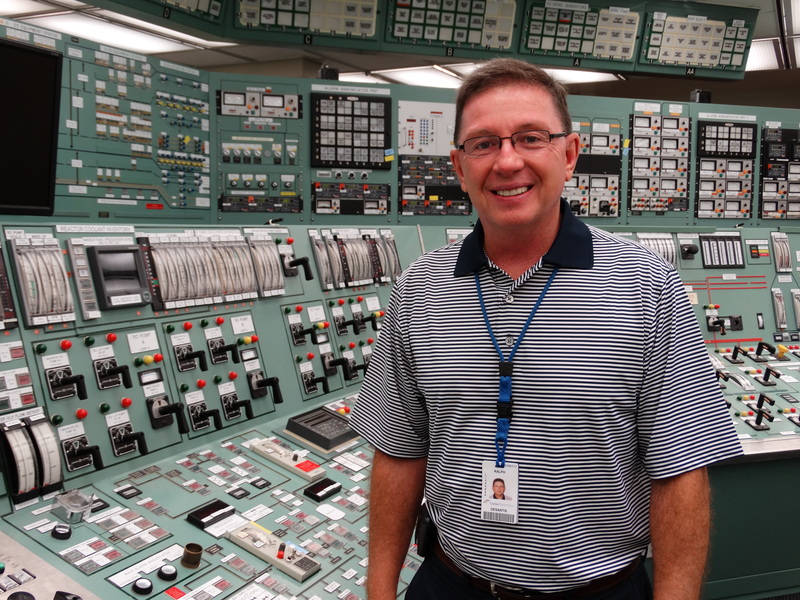 Mr. DeSantis standing inside the TMI training center, which features an exact replica of the switchboards inside the plant. Workers must train here for 18 months to be certified to work in TMI. A view of what the inside of the TMI control room would look like. Taken at the training center across the river.